Sacred Sites is our most popular tour, and no wonder — it traverses the Peloponnese peninsula where Greek mythology was practically born. The antiquities in this region are incomparable. 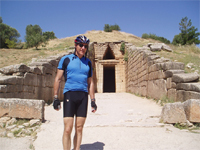 Visit Mycenae where King Agamemnon is buried, the ruler who launched the Trojan War. There’s Epidavros Theater with its impeccable acoustics and millennia later is still in use, now by modern Greeks staging ancient Greek dramas. The beauty of this tour is that you will cycle directly to all these precious sites. 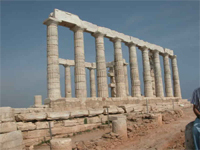 The tour crosses the Corinth Gulf by ferry boat to get to the mainland to go to Delphi which the ancients regarded as the center of the universe. Here is where the city-states called upon the oracles to prophesize their futures. Evia island is the final destination of the tour. At Loutro Edipsos you stay in spa built atop natural thermal healing waters which spew into the hotel swimming pools. 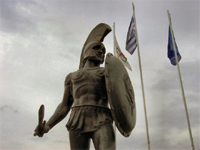 The May 12-13 tour offers a special one-time-only guest cyclist -- a West Point professor of military history with an expertise in ancient Greek military history who will give daily seminars en route. Day 7: 42 km/26 miles, climbing up to 2600 ft.
Day 9: long route: 117km/71 miles initial climb, long descent, flat, then 10km ascent. Short route: 51km/31.5 miles climb, long descent, flat. Day 10: long route: 114km/70 miles, several ascents/descents. Short route: 62km/38 miles one ascent, long descent, flat.